Visiting Australia's Northern Territory? Here's what you can expect. AUSTRALIA has so much more to offer beyond Sydney, white sand beaches, and the Great Barrier Reef. 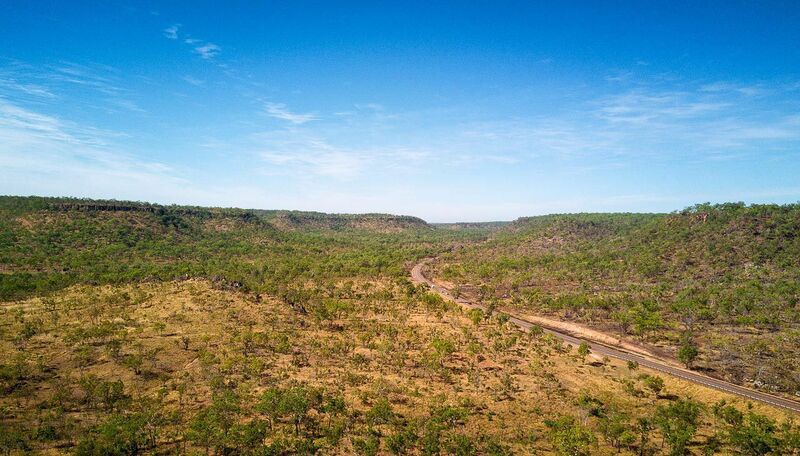 I was fortunate enough to go to the Northern Territory — the Top End, which is the Northern strip of this territory. Check out some of my favorite images from this intriguing and relatively unvisited area. The Northern Territory is sparsely populated — the fewest residents of all the Australian states. But it occupies 1/6th of the country’s land, so it’s a place of wide open spaces and is the site of Alice Springs, the normal stop-off for people seeing the Outback and visiting Uluru-Kata Tjuta National Park . I visited 3 areas within the NT: Darwin, Kakadu, and Arnhem Land. 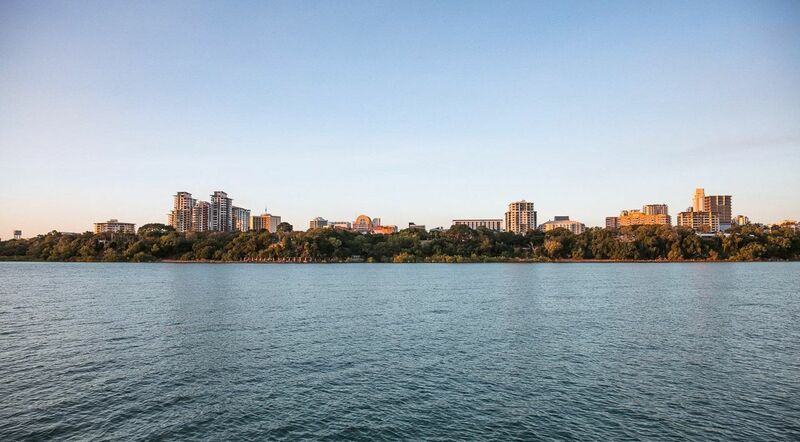 Darwin was named after Charles Darwin and has just about 140k inhabitants. It’s the bustling metropolis of the Northern Territory and 15th most populated city in Australia. It sits on the Timor Sea facing Timor-Leste and Indonesia and is about 30 Celsius year round. There’s a ton of great beef up here — an export of the territory — and great Australian red wines. 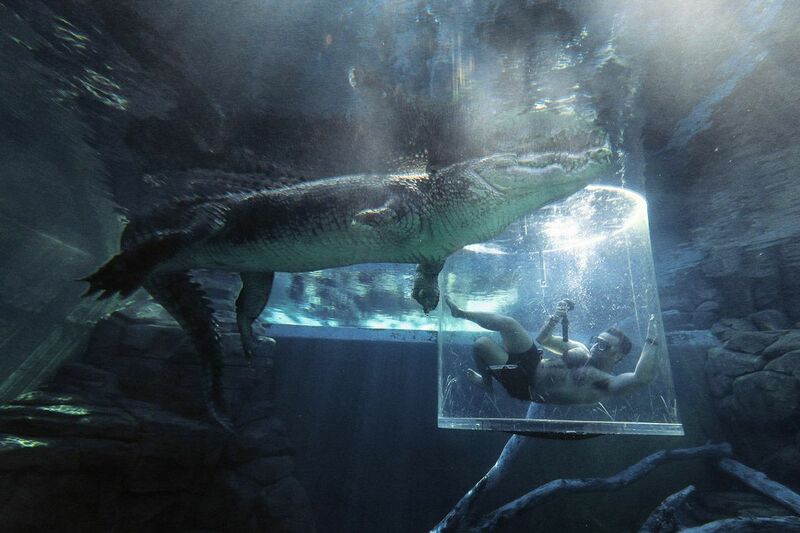 While in Darwin, I went for a dip at Crocosaurus Cove . I was lowered into a plastic-protected area to observe the crocs. Chopper is nearly 18-feet long and about 80-years old, and his jaws are capable of exerting three tons of pressure per square inch. Arnhem Land is two hours from Darwin. Arnhem Land has a deep indigenous culture: of its total population of 16,000, nearly 12,000 are Yolngu Indigenous Australians. The ratio of Aboriginal Australians to colonizers is higher here than anywhere else in Australia. Many of the people live in tiny villages known as homelands or outstations. There is little outside influence in those communities, thereby preserving the Indigenous language, culture, and history. Arnhem Land was declared a reserve in the 1930s. 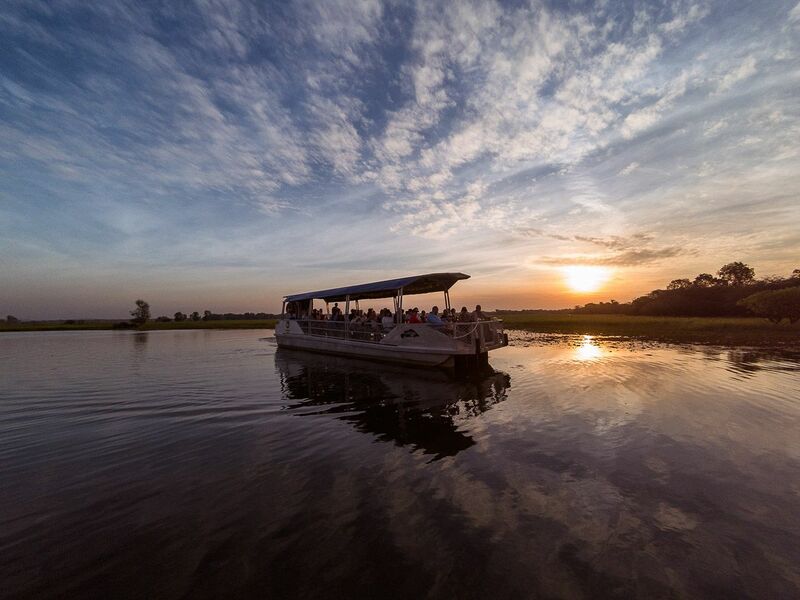 It is only open to outsiders during the dry season, and you need a permit to enter. Once inside you can take guided hikes with indigenous guides to learn more about the history. Our guide, Tomo, took us to see rock paintings that are guessed to be about 20,000 years old, though the land has been inhabited for even longer than that. 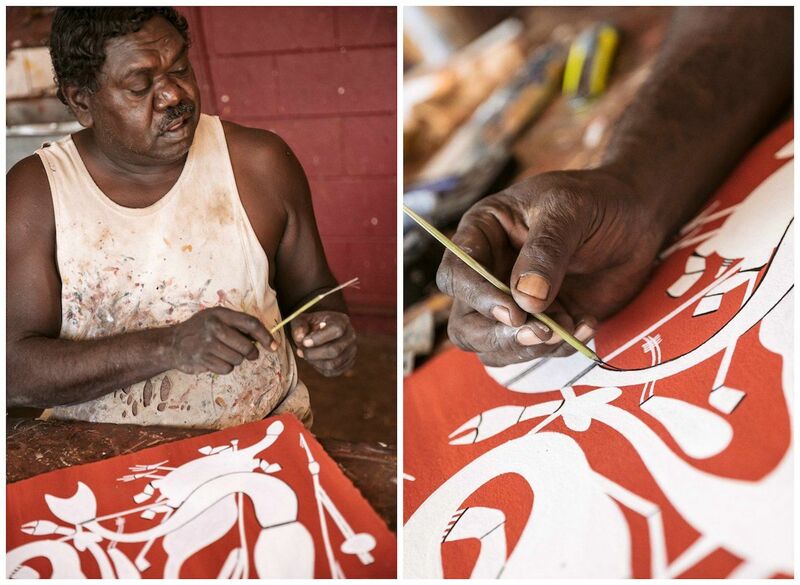 I visited the Injalak Arts Center, which is in an indigenous settlement in Arnhem Land. It’s a chance to see how they’re making their crafts and purchase a few if desired. The proceeds help the Aboriginal communities and outstations, fund transmission of the traditions, and helps to preserve the methods used. 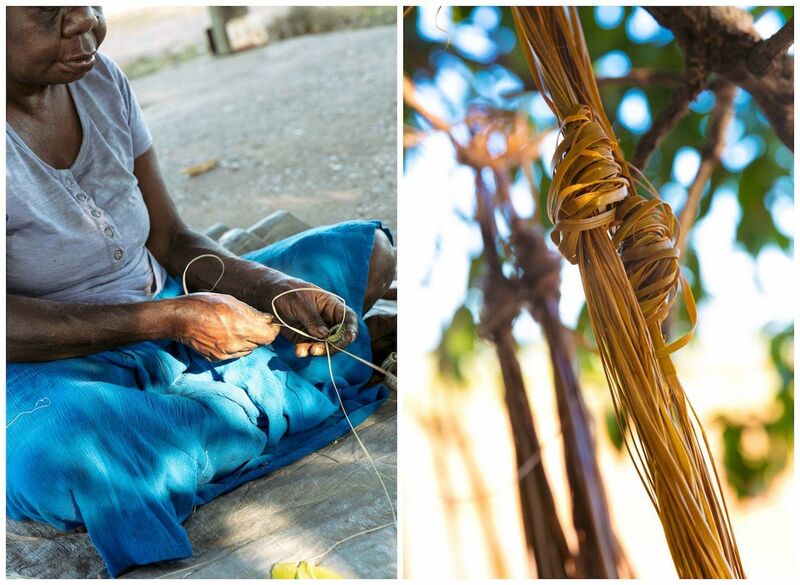 This is Christine Nabobbob weaving baskets out of dried pandanus leaves. This is Gabriel Maralngurra, preparing his brush. The brushes are made from sedge, a grassy flowering plant, and require a steady hand. After visiting Arnhem Land, we headed to Kakadu National Park. 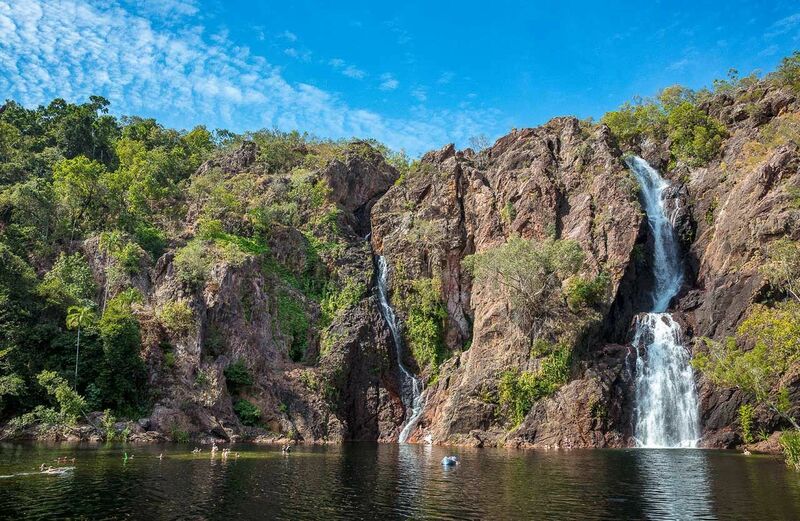 It’s one of the most biodiverse places in the Top End and is a UNESCO world heritage site. This is the view from Barkk Walk, one of many hikes in the area. 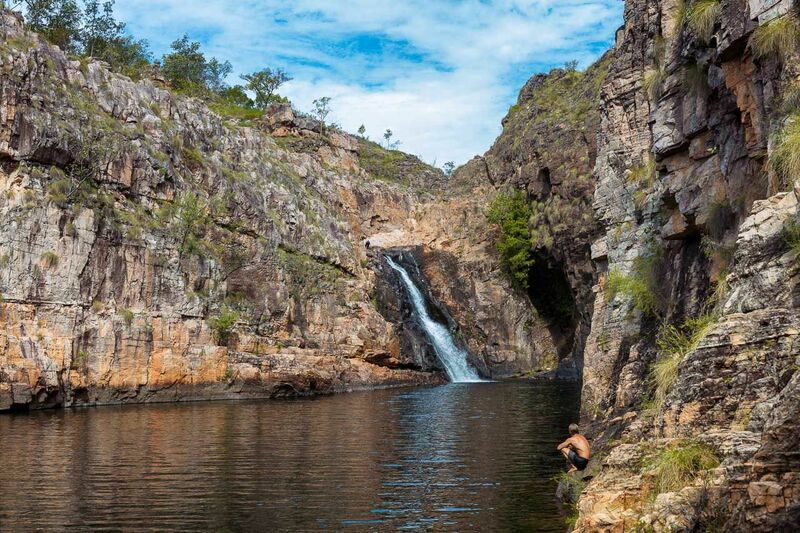 There are plenty of swimming holes (croc free), viewpoints, and cultural activities in the area. 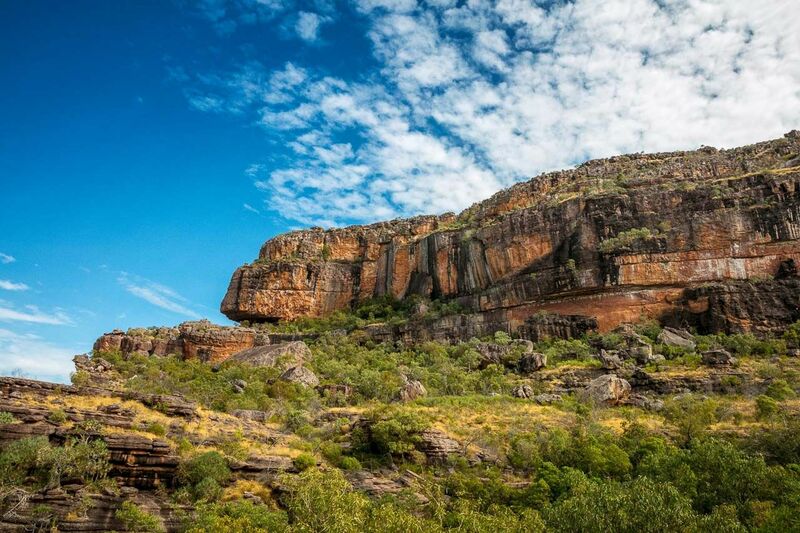 Barrumundi gorge is in the south of Kakadu. Also known as Maguk Gorge, it takes a four-wheel drive car and a short hike to reach this place, but the clear pools are worth the effort. You can continue hiking up and around the Gorge for higher views. We stopped up here for lunch, which our guide Sab prepared for us as part of our tour. I really recommend having a guide to get you around these rural areas, help you to appreciate the history and culture, and show you the spots you might miss just on your own. My guide was from Lords Safaris. I got to see Kakadu from the river on a Yellow water cruise . This let me view the wetlands at sunset, a multi-hued end of the day. Cruise hosts narrated the trip, explaining how the indigenous peoples lived off the land, the seasons, and how life ebbs and flows here. We saw several crocs as we went and dozens of species of birds. Sometimes you can spot water buffalo. 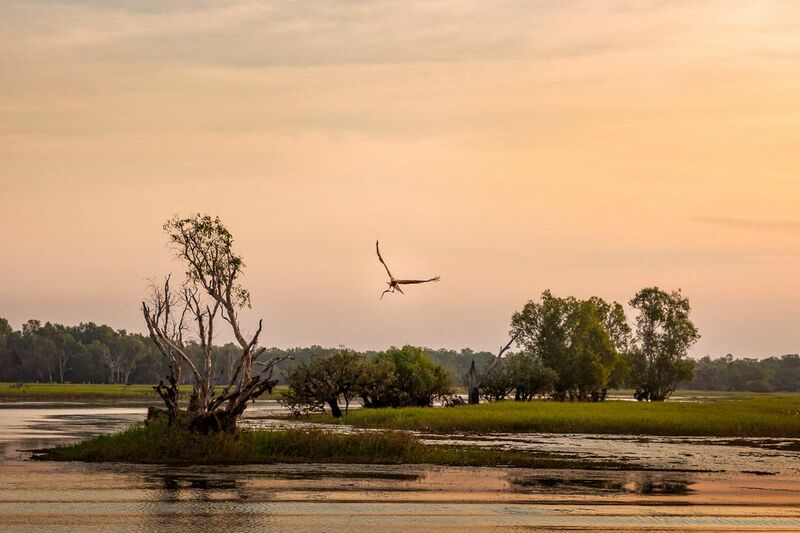 In this shot, a kite bird skirts along the billabong. Back in Kakadu Park, we came across this rare black wallaroo, the smallest member of the kangaroo family. It’s a shy animal and nocturnal at that, so when spotted most people get just a glimpse. Not much is known about them, as they are very shy, but they’re a threatened species and are only found in Kakadu. 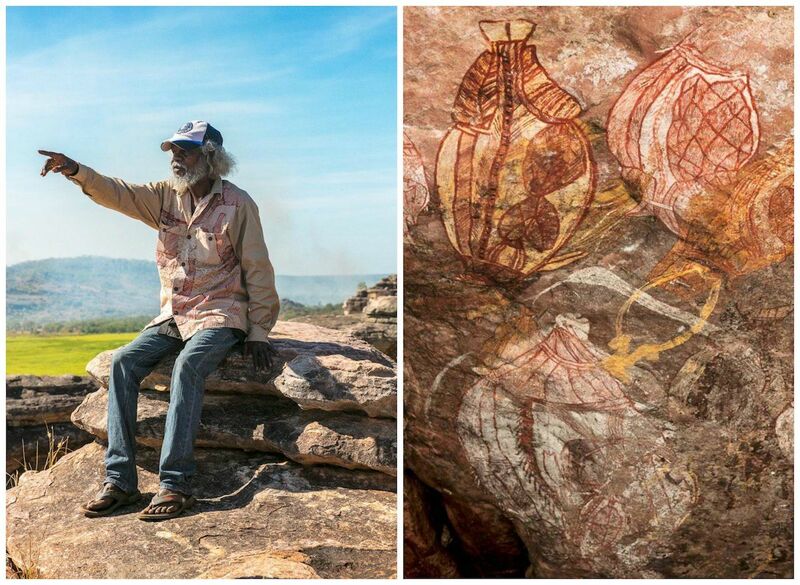 I was told that most people go their whole lives in the Northern Territory and never see one. I am really grateful this female stopped for me. 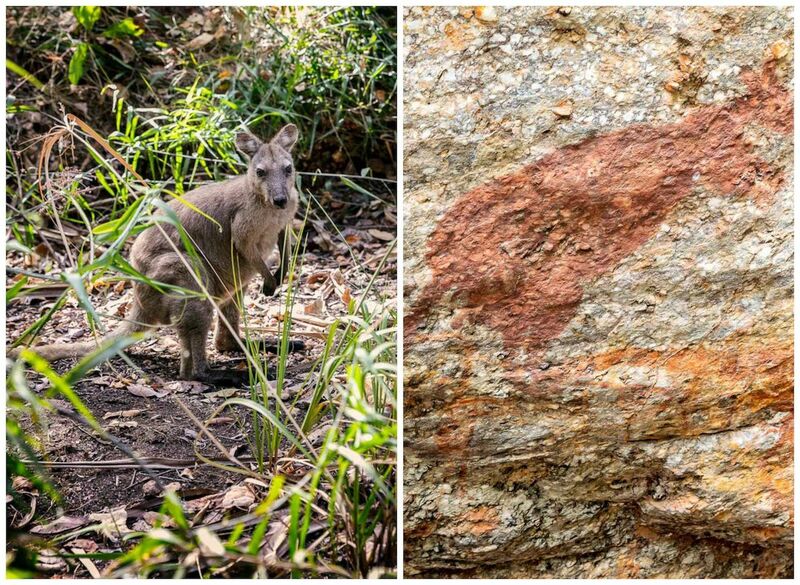 On the right, an indigenous painting of a Kangaroo found within the park. South of Darwin we visited Litchfield National Park, known for its massive waterfalls (like Florence Falls and Tolmer Falls ), more swimming holes, and also termite mounds — which, from far away, looked like gravestones. They’re harder than concrete, can grow up to 9 feet high, and they all face the same direction. 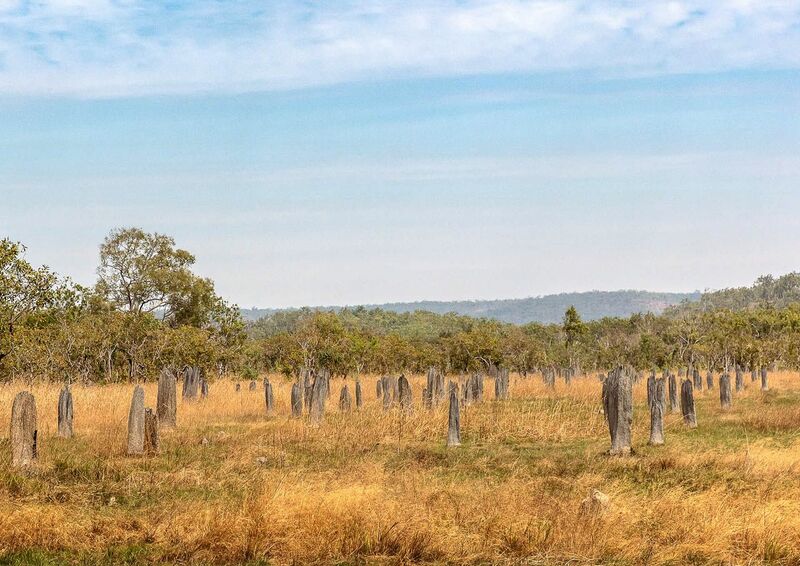 They are Magnetic Termite Mounds , meaning that they are in line with the earth’s magnetic field and are all formed flat on the east to west side while the thin side is north to south. This design minimizes heat from the sun. There are also tunnels, chimneys, insulation, and even nurseries for baby termites. We visited plenty of waterfalls and swimming holes at Litchfield, but I ended this trip at Wagni Falls. These falls are loud and the water was perfect. It was a fantastic spot to end a whirlwind tour of the Top End. 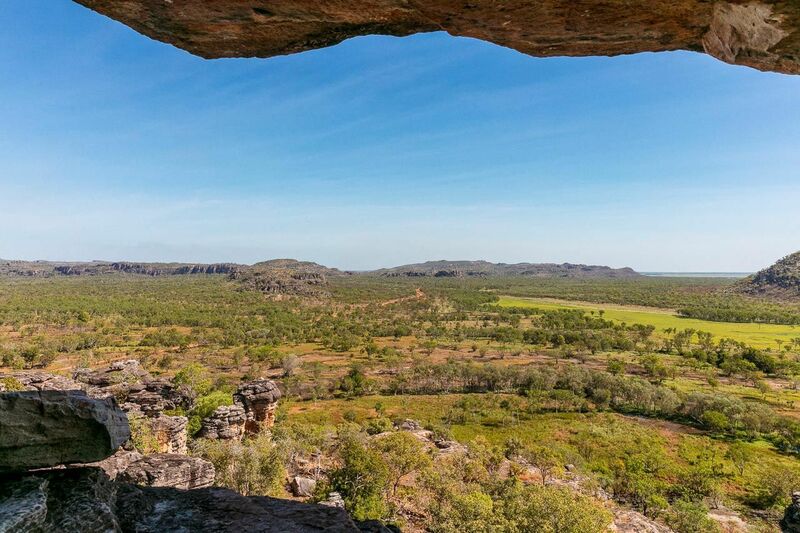 While most venture to NT to see Urulu and turn around, if you go to the Top End and visit some of these lesser-known spots, you will be rewarded with Aboriginal culture, fewer crowds, and amazing geographical features.